I-937 currently applies to 17 of the state’s 62 utilities, including Avista, Chelan Public Utility District and Seattle City Light. 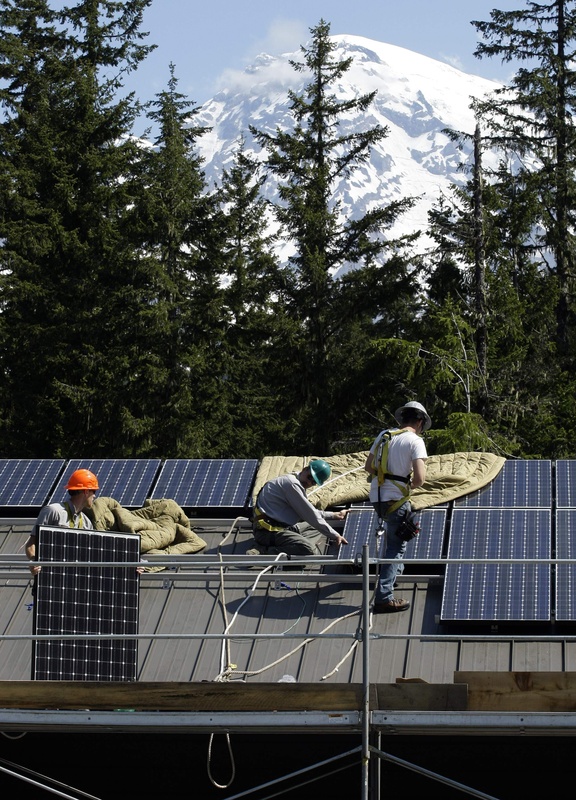 SEATTLE – Large utilities in Washington state will soon have to get at least part of their power from new renewable sources like wind and solar. But with a voter-mandated 2012 deadline looming, Gov. Chris Gregoire is weighing a package of changes that could expand the definition of what clean energy is. Initiative 937 requires almost a third of the state’s utilities – those with at least 25,000 customers – to ramp up to getting 15 percent of power through wind, solar, geothermal and certain woody biomass by 2020. The governor wants to provide a broader recognition of the state’s clean energy to help attract businesses to the state, as well as make sure the law is working in a cost-effective way, said her policy adviser, Keith Phillips. Lawmakers, utility officials, environmentalists, business leaders and others are meeting with the governor’s office in Olympia today to discuss potential changes that may be included in legislation next year. What should count toward that clean-energy standard has been a hotly debated issue in the Legislature over the years, with numerous bills aimed at changing the law but none successful so far. Some of those bills are sure to surface again in the legislative session that begins Jan. 9, including attempts to recognize hydroelectric power as eligible toward I-937. About two-thirds of the state’s energy mix comes from clean hydroelectric power, but existing hydropower isn’t eligible, partly because the initiative was aimed at spurring development of new clean energy. Even with so much clean energy in Washington, there’s a perception problem when it comes to luring businesses that want clean energy to the state, Phillips said. “Any time you make changes, there are economic winners and losers,” said Rep. Dave Upthegrove, D-Des Moines, who heads the House environment committee and has been studying possible changes to I-937. For example, he said, some utilities and businesses would like to make more biomass eligible, but that could devalue utilities that have heavily invested in wind power. I-937 currently applies to 17 of the state’s 62 utilities, such as Spokane-based Avista, Chelan Public Utility District and Seattle City Light. Benton County PUD spokeswoman Karen Miller said the governor’s proposal would help but wouldn’t take care of its biggest problem: buying energy it doesn’t need. Clark County Public Utilities is buying $13 million in renewable credits to meet the 2012 standard. The law assumed utilities would see a certain amount of growth, but that hasn’t happened, said Dean Sutherland, the utility’s senior manager of government and community affairs. The utility purchased wind power in anticipation of I-937 but its customers don’t need the electricity, he said. Utilities should be allowed to acquire renewable resources only to meet its load growth, he added. “There are some inefficiencies that we think are costing our customers more than we think is necessary,” he said.